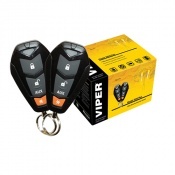 This entry level Viper security system will wrap your vehicle in protection, with the most sophisticated electronic technologies available today, including the Stinger® DoubleGuard® shock sensor, Battery Back-Up Siren and Failsafe® Starter Kill Immobiliser - Now featuring 4-button remotes, Control Center, and XR+ receiver. This state-of-the-art system also offers in-demand convenience feature like keyless entry. This entry level Viper security system will wrap your vehicle in protection, with the most sophisticated electronic technologies available today, including the Stinger® DoubleGuard® shock sensor and Failsafe® Starter Kill Immobiliser - Now featuring 4-button remotes, Control Center, and XR+ receiver. This state-of-the-art system also offers in-demand convenience feature like keyless entry. The number and type of remotes that come with the system. Viper systems use Radio Frequency (RF) technologies to communicate with your vehicle, and these technologies each have a typical operating range. Range varies by the technology used, but also because of environmental factors such as interference from other RF sources. Currently Viper systems with the longest range use Spread Spectrum Technology (SST) with range up to 1.5km. Unlock your vehicle's doors with the push of a button on your keychain remote. Viper systems with Boot Pop can open your power boot with the push of a button. A Viper SmartStart module can be added to this system to make your vehicle SmartStart ready. Clone-safe, anti-Code Grabbing technology comes standard on every Viper system. A great safety feature: illuminates your vehicle's dome light for 30 seconds when you disarm your security system or unlock the doors of your remote start system. Each Viper security system comes standard with the dual stage Stinger DoubleGuard shock sensor, which detects blows or impacts to the vehicle and can discriminate light impacts from heavy ones. Failsafe Starter Kill Keep your car where you parked it with the Failsafe Starter Kill, an immobilizer designed to prevent hot-wiring. VRS is a user-operated anti-carjacking system. Once activated, if your vehicle is carjacked, 30 seconds later the siren will start screaming for help and the lights will flash. When the carjacker pulls over and turns off the ignition, the starter kill will activate, which should prompt the carjacker to then abandon your vehicle for eventual recovery. Auxiliary channels are electrical outputs controlled by your keychain remote, which your installer can interface with systems in your car to allow you to operate them by remote control.